Back when I did the first Prose Verse Babel post (before it was even named), I was listening to a few book-related podcasts. In one, Books on the Nightstand, I discovered a cool activity in which you take the titles on the spines of books…and create a poem from it. I decided that this needed to become a regular thing on A Life Among the Pages, so I started posting my poems. Then, I asked others to share their books/poems. 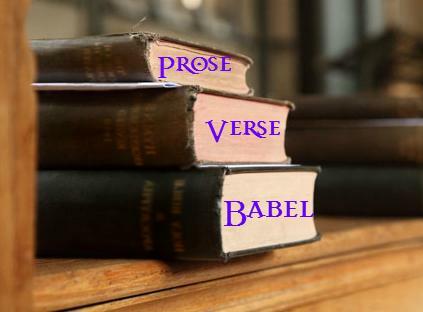 Prose Verse Babel was created then, and I hope to keep it going for as long as possible. What’s great about these posts is the freedom and limitations book titles give us. There’s no need to be great at poetry, and often, it’s better not to be a poet, haha. The poems can be as meaningful or random as you’d like. The key is that “writing” them is FUN! I like to emphasize that you should have some fun with them. Basic “rules” – Take a picture of the stack of books and include the text formatted how you’d like it to be read (after initially contacting me with interest in doing one). While the words of the poems should be the titles (you can slightly alter the words if needed, but as true to the titles as possible for obvious reasons), I feel it should be stated that you should break the lines wherever you feel necessary and add punctuation wherever you’d like. This helps be a little more creative and the poems can mold to your style a little better.